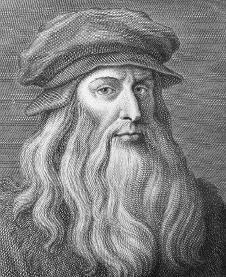 Leonardo da Vinci was born on April 15, 1452, near the village of Vinci about 25 miles west of Florence. He was the illegitimate (born to unmarried parents) son of Ser Piero da Vinci, a prominent notary (a public official who certifies legal documents) of Florence, and a local woman, Caterina. Not much is known about Leonardo's childhood except that when he was fifteen, his father apprenticed him to Andrea del Verrocchio (1435–1488), the leading artist of Florence and the early Renaissance. Verrocchio, a sculptor, painter, and goldsmith, was a remarkable craftsman. He had great concern for the quality of execution in expressing the vitality of the human figure. These elements were important in the formation of Leonardo's artistic style. It should be noted that much in Leonardo's approach to art originated from using tradition, rather than rebelling against it. Leonardo, after completing his apprenticeship, stayed on as an assistant in Verrocchio's shop. His earliest known painting is in Verrocchio's Baptism of Christ (c. 1475). Leonardo executed one of the two angels as well as the distant landscape, and he added the final touches to the figure of Christ, determining the texture of the flesh. Collaboration on a major project by a master and his assistant was standard procedure in the Italian Renaissance. What is special is that Leonardo's work is not a slightly less skilled version of Verrocchio's manner of painting, but an original approach which changed the surface effects from hard to soft, making the edges less cutting, and increasing the slight changes of light and shade. About 1478 Leonardo set up his own studio. In 1481 he received a major church commission for an altarpiece, the Adoration of the Magi. In this unfinished painting, Leonardo's new approach is far more developed. A crowd of spectators, with varied faces, looks at the main group of the Virgin and Child. There is a strong sense of continuing movement. Leonardo placed the Virgin and Child in the center. Traditionally in paintings of this theme they had appeared at one side of the picture, approached by the kings from the other side. Earlier Renaissance artists had applied the rules of linear perspective, by which objects appear smaller in proportion as they are farther away from the eye of the spectator. Leonardo joined this principle to two others: perspective of clarity (distant objects are less distinct) and perspective of color (distant objects are more muted in color). He wrote about both of these principles in his notebooks. The Magi alterpiece was left unfinished because Leonardo left Florence in 1482 to accept the post of court artist to the Duke of Milan. In leaving, Leonardo followed a trend set by masters of the older generation who went to Venice and Rome to execute commissions larger than any available in their native Florence. Leonardo presented himself to the Duke of Milan as skilled in many crafts, but particularly in military engineering. He also produced remarkable machinery for stage set-ups. Both activities point to his intense interest in the laws of motion and propulsion (the movement or push forward), a further aspect of his interest in things and their workings. Leonardo's first Milanese painting is the altarpiece Virgin of the Rocks. It makes use of a respected tradition in which the Holy Family is shown in a cave. This setting becomes a vehicle for Leonardo's interests in representing nature in dimmed light, which blends together the outlines of separate objects. He once commented that artists should practice drawing at dusk in courtyards with walls painted black. unsuccessful. The paint did not stick well to the wall, and within fifty years the scene was reduced to a confused series of spots. What exists today is largely a later reconstruction. When the Duke of Milan was overthrown by the French invasion in 1499, Leonardo left Milan. He visited Venice briefly, where the Senate consulted him on military projects, and traveled to Mantua. In 1500 Leonardo returned to Florence, where he was received as a great man. Florentine painters of the generation immediately following Leonardo were excited by his modern methods, with which they were familiar through the unfinished Adoration of the Magi. Leonardo had a powerful effect on the younger group of artists. Leonardo even served a term as military engineer for Cesare Borgia in 1502, and he completed more projects during his time in Florence than in any other period of his life. In his works of these years, the concentration is mostly on portraying human vitality, as in the Mona Lisa. It is a portrait of a Florentine citizen's young third wife, whose smile is called mysterious because it is in the process of either appearing or disappearing. Leonardo's great project (begun 1503) was a cavalry battle scene that the city commissioned to adorn the newly built Council Hall of the Palazzo Vecchio. The work is only known today through some rapid rough sketches of the groups of horsemen, careful drawings of single heads of men, and copies of the entire composition. Leonardo began to paint the scene but was called back to Milan before the work was completed. A short time thereafter, the room was remodeled and the fragment was destroyed. Leonardo was called to Milan in 1506 by the French governor in charge to work on an equestrian statue (a sculpture of a leader riding a horse) project, but he produced no new paintings. Instead he turned more and more to scientific observation. Most of Leonardo's scientific concerns were fairly direct extensions of his interests as a painter, and his research in anatomy (the structure of a living organism) was the most fully developed. Early Renaissance painters had attempted to render the human anatomy with accuracy. Leonardo went far beyond any of them, producing the earliest anatomical drawings still followed today. Leonardo filled notebooks with data and drawings that reveal his other scientific interests: firearms, the action of water, the flight of birds (leading to designs for human flight), the growth of plants, and geology (the study of earth and its history). Leonardo's interests were not universal, however. Theology (the study of religion), history, and literature did not appeal to him. All his interests were concerned with the processes of action, movement, pressure, and growth. It has been said that his drawings of the human body are less about how bodies are and more about how they work. In 1513 Leonardo went to Rome, where he remained until 1516. He was much honored, but he was relatively inactive and remarkably aloof (apart) from its rich social and artistic life. He continued to fill his notebooks with scientific entries. The French king, Francis I (1494–1547), invited Leonardo to his court at Fontainebleau, gave him the title of first painter, architect, and mechanic to the king, and provided him with a country house at Cloux. Leonardo was revered for his knowledge more than for any work he produced in France. He died on May 2, 1519, at Cloux. Leonardo's influence on younger artists of Milan and Florence was enormous. Among these were Filippino Lippi (1457–1504) and Andrea del Sarto (1486–1531) who were able to absorb and transmit his message rather than merely copy the unimportant aspects of his style. On a more significant level, Leonardo influenced the two greatest young artists to come in contact with him. Raphael (1483–1520) came to Florence in 1504 at the age of twenty-one, and quickly revealed Leonardo's influence in his portraits and Madonnas. Also, about 1503, Michelangelo (1475–1564) changed from a sculptor of merely grand scale to one whose figures are charged with energy. This may be seen in the contrast between Michelangelo's early David and his later St. Matthew. From this time on Leonardo influenced, directly or indirectly, all painting. However, most of Leonardo's scientific observations remained unproven until the same questions were again investigated in later centuries. Clark, Kenneth. Leonardo da Vinci. Rev. ed. New York: Viking, 1988. Kemp, Martin. Leonardo da Vinci, the Marvellous Works of Nature and Man. Cambridge, MA: Harvard University Press, 1981. Turner, A. Richard. Inventing Leonardo. Berkeley: University of California Press, 1993. Did he ever own his own triple storey masion.I mean he must of bee pretty rich with all those occupations and probably pretty busy with all those things to do he wuold of had his hands full. Did leonardo da Vinci ever made a business or did he ever made a factory in his early life? Who was the one that inspired and helped Leonardo Da Vinci with his art? I think Leonardo's most famous paintings were 'The Last Supper' and the Mona Lisa, don't you think? Lenin, Vladimir Lewis, C. S.